This simple, one-pan dish requires very little preparation and makes a great main course for our summer menu. To make the marinade, mix together the ginger, tomato purée, soy sauce, honey and oil in a large, shallow dish. Add the pork to the marinade, ensuring it is well coated. Heat a large, non-stick frying pan over a moderate heat. Place the marinated pork in the hot pan. Reduce the heat slightly and cook for 7-8 minutes on each side until thoroughly cooked, the juices run clear and there is no pink meat. Add the peach quarters to the pan and cook, uncovered, for about 1-2 minutes on each side until just softened and slightly charred. 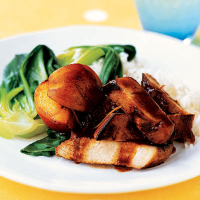 Serve the pork and peaches with boiled white rice and steamed pak choi. Try the rest of this month's alfresco menu: Warm Salad with Tomato, Avocado and Mozzarella, and Baked Summer Fruits. You can use a 410g can Waitrose Peach Halves in Fruit Juice instead of fresh peaches. Drain the fruit, reserving the juice. Halve the peaches and add to the pan, as above. Boil the reserved juice until it has reduced by half and stir into the pork at the end of cooking time.